More mistakes in Monsters, Inc.
Trivia: The voice behind Roz, the number 1 of the Child Detection Agency and the undercover secretary, is actually a man. Trivia: Mike and Celia have dinner at Harryhausen's. This is a tip of the hat to Ray Harryhausen, the great stop-motion animator. 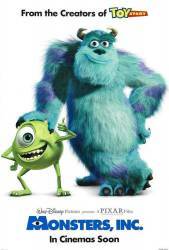 More trivia for Monsters, Inc.
Henry J. Waternoose: There's nothing more toxic or deadly than a human child. A single touch could kill you. Leave a door open, and one can walk right into this factory; right into the monster world. Trainee: I won't go into a kid's room. You can't make me. Henry J. Waternoose: Kids these days. They just don't get scared like they used to. More quotes from Monsters, Inc. Question: At the end of the movie, Fungus is seen amongst the employees promoting doing fun stuff, but since he is seen assisting Randall, and generally helping him and Waternoose with the scream machine earlier on, shouldn't he have been banished (like Randall) or hauled off by the CDA (like Waternoose) when the whole plan came to the CDA's attention? Chosen answer: Fungus was an unwilling lackey, not a co-conspirator. Question: After Monsters, Inc. has switched over to "laugh power", the scare floor has a very different look. There's a board in the back with "JOKE OF THE DAY" written on it. Can anyone see the text of the joke? Chosen answer: The Doctor says to the patient, "What seems to be the problem?" The patient lifts his arm and says "It hurts when I do this." The Doctor says "don't do that." More questions and answers from Monsters, Inc.